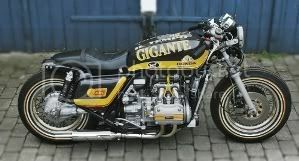 The NGW Project Bike.DYNA electronic ignition.How-to INSTALL - NGWClub®, Inc.
and folks asking if it's difficult etc. I'm just adding pictures and a bit of blahblah. which means that it comes with a ballast resistor. right behind the middle frame tube. Ballast resistor (white thingy) and coils. on US-bikes; you have the Reserve Lightning System etc. to the (separate) RED wire supplied with the kit. Find where the original points-wires plugs in. the original wire-routing up to next to the battery. (which are attached to the side of the battery-box). so you can wiggle/pull out and remove the cam-"sleve"/"tube". This can be very tricky, but please do not use force! The springs should freely return the sender unit to the static position. Now place back the advancer/signal-unit back on the shaft/axle. because of the centrifugal forces. as the RPM goes up, and is fully advanced at over 2600RPM. If stuck in that position you'll have faulty ignition timing at anything lower than approx. 2600rpm's. Last edited by octane on Sun May 06, 2007 5:07 am, edited 15 times in total. Whoa there now. You've told me step by step how to install it. But you didn't tell me how to time it. Oh well, I'll just buy a ticket to the next event. As usual, Octanes pictorials and explanations are superb. Can anyone tell me what spec that Dyna resistor is? Mine needs replacing and i can't find info on it from Dyna. I'm running stock coils. Sure like the strong spark when it's bypassed but i'd like the coils to last at least another season. How much are the reservrd seats for the timing pictorial? I want front row seats! Hope there not sold out. nomados wrote: Great tutorial, thanks. I don't need the resisitor any more. You can have it, if you can wait for the mail from Denmark to reach you. Thanks Octane, that's a kind offer. So you still have it eh? Any chance you have an Ohmeter around that you could test that baby and let me know how many ohms it is? I can't find that answer anywhere, and there's lots of conflicting info. My Dyna resistor was the piggy back added to the 3 Ohm OEM ballast. Piggy back was 2 Ohms, and the OEM is 3 ohms so in parallel that equates to 1.2 Ohms. Others say they had 1.5 Ohms, so i'm really curious as to what yours would read. I'd really appreciate it, but i totally understand if you'd rather spend your time tweaking that blower! my crappy ohm-meter won't measure such a low ohm. I'll see if I can find someone who has one that will. Anyway; the offer still stands. Just PM me you adress. Thanks but i think she's all sorted out. Talked to Dyna and they recommended 1.2 ohms, which was what i calculated having before, so that was good enough confirmation for me. Picked up a standard 1.2 ohm resistor for 8 bucks. My bike has 2 ballasts the kit only has 1 how and where do the other 2 wires go? Can you explain why you have two ballasts? did you already have dyna ignition? my bike had two ballasts also, one was stock 3 ohm, one was Dyna 2 ohm. Wired in parallel, this made 1.2 ohm. If you have a new kit, Dyna only supplies one 1.2 ohm ballast now. In which case your old ballasts would be removed and the single ballast would be installed in their place. If none of this makes sense pics may help if you have some. and install ONLY the new DYNA resistor. nomados wrote: ..... my bike had two ballasts also, one was stock 3 ohm, one was Dyna 2 ohm. Wired in parallel, this made 1.2 ohm. If you have a new kit, Dyna only supplies one 1.2 ohm ballast now. In which case your old ballasts would be removed and the single ballast would be installed in their place. ..